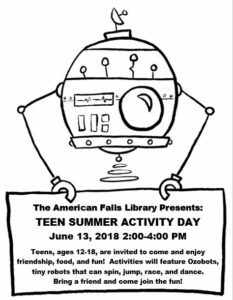 ← The AF Library recently partnered with the American Falls High School Senior Project Program and Spanish classes to present El día de los niños/El día de los libros (Children’s Day/Book Day), a multicultural celebration of children, families, and reading. Senior, Emilia Carrillo, as part of her Senior project, took the lead in planning the event. Under the direction of Spanish teacher Hailey Lusk, Emilia enlisted the help of classmates to present a funfilled evening where families enjoyed crafts, snacks, story times, games and a chance to win raffle prizes. Each family got to choose a free book to take home, made possible through a program from the Idaho Commission for Libraries.